Another interesting advance for those of us who use insulin pumps. 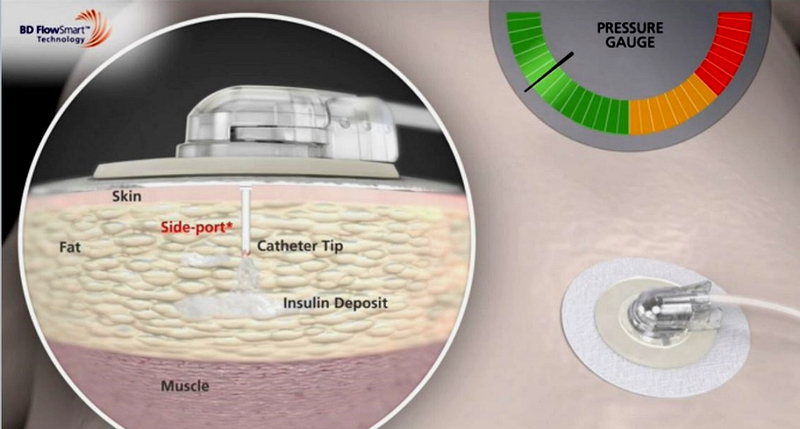 According to Amy Tenderich of DiabetesMine (http://www.healthline.com/diabetesmineWhen you start on an insulin pump, everyone talks about precision calculation of your insulin doses — as if that alone would magically make your blood glucose levels just right. NOT. There are so many uncontrollable factors and annoying side effects that weigh in! Not least of which are infusion site issues — problems at the spot where the insulin is supposed to be flowing in, but for a myriad of reasons, is not doing so as it should. Finally, this issue is getting the attention it deserves! JDRF and the Helmsley Charitable Trust collaborated with infusion tech leader BD to support new research and product development that culminated this summer in the launch of a joint BD/Medtronic new infusion set called BD FlowSmart that’s designed specifically to help eliminate disruptions in insulin delivery.